Are you visiting Japan in the autumn season e.g. late Oct, Nov, early Dec? 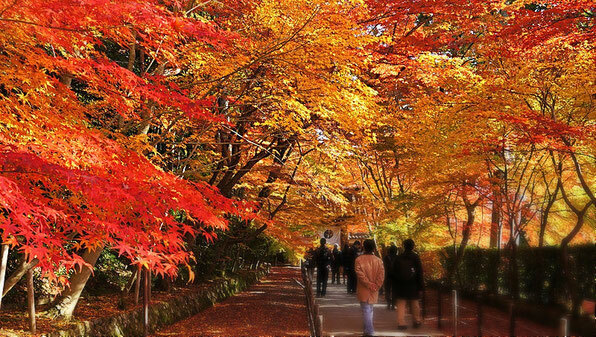 If asked which is the best season to visit Japan, we say autumn. It is because the season is not as hot as summer and not as cold as winter. The spring is another great time with cherry blossoms but some may have the pollen allergy (like us) so it may be necessary to carry tissue paper around to blow noses.. In autumn, there is no big allergy problem. And you see what Japanese call "Koyo / the red leaves" where many type of trees change its color to red, yellow and brown to make the beautiful scenery here and there. There are many beautiful places and here we try to share with you some locations not too well known. Red leaves reflected in the surface of the pond. You can only enjoy the view probably on the limited timings. The color of the leaves should be bright enough, the sky needs to be clear and there should not be wind to make the water surface a mirror. You check the weather report well to make sure you capture the rare sight. How is your experience in Autumn in Japan? Do you know another great place to visit in Japan in fall? Please share with us!